The 43-year-old – who has not been named – had taken just a few bites of the Japanese pancake okonomiyaki when she started wheezing, broke out in a rash and struggled to breathe. The woman was rushed to a hospital where she told doctors in Japan she had made a pancake from flour that had been kept in an open bag for a year in an ‘underfloor storage unit’. When she provided a sample of the flour, scientists found up to 4,500 dust mites per gram. An allergy test revealed the woman had a dust-mite allergy but was not allergic to any of the other pancake ingredients, which included egg, yam, pork, prawns and squid. The patient made a ‘rapid recovery’ following oral – and IV – steroids, as well as antihistamines. 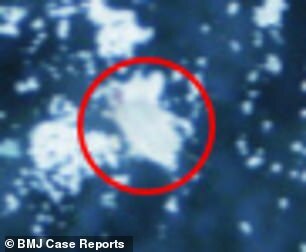 The incident was written in a BMJ Case Report by Dr Katsunori Masaki, from the department of internal medicine at Saiseikai Utsunomiya Hospital on Japan’s main Honshu island. Dr Masaki treated the patient. While cooking the pancake – which she made at home for her family – the woman experienced a runny nose and sneezing due to ‘aerosol distribution of the mite allergen during food preparation’. Upon eating it, her discomfort soon escalated into other tell-tale allergy symptoms, as well as abdominal pain and diarrhoea. Her relatives, who ate the same meal, were fine. The woman – who suffers from hay fever – went to A&E, where she was successfully treated. She later provided a sample of the flour to be examined under a microscope. 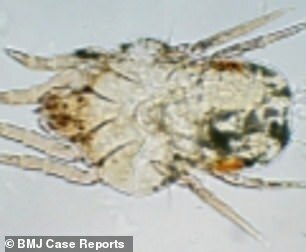 Scientists found 4,500 Dermatophagoides farinae dust mites per gram. They also uncovered 11 of the microscopic mite species Chelacaropsis moorei per gram of flour. A dust-mite allergy is common, with symptoms usually including a runny nose, swollen eyes and tight chest. In rare cases, eating large amounts of the microscopic mites causes severe symptoms – known as oral mite anaphylaxis – due to the creepy crawlies often being heat resistant. Oral mite anaphylaxis is considered a ‘hidden’ cause of severe allergic reactions and is often overlooked by doctors. It has previously been linked to pizza dough, scones and cakes. The danger lies in the fact contaminated flour looks normal – white and dry – when it is in the bag. The authors warn dust mites are more likely to contaminate flour in ‘tropical and subtropical areas’ due to these regions’ high temperatures and humidity.